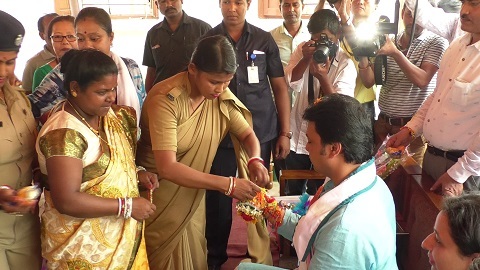 Hundreds of women and young girls including students and police personnel gathered at the official residence of Tripura Chief Minister on Sunday afternoon to tie rakhi on the wrist of the young Chief Minister Biplab Kumar Deb on the occasion of Rakhi Purnima. Deb who was overwhelmed with the gesture of love and faith shown on him expressed that this has further increased his responsibility towards making a safer, stronger and developed Tripura and he shall try his best to achieve that. Along with the Chief Minister, the visitors also tied rakhi to his wife and children who also took part in the festival. Raksha Bandhan, is an Indian and Nepalese festival observed on the last day of the Hindu lunar calendar month of Shraavana and centers around the tying of a thread, bracelet or talisman on the wrist as a form of bond and ritual protection. The expression Raksha Bandhan literally means the bond of protection, obligation, or care, is now principally applied to this ritual.